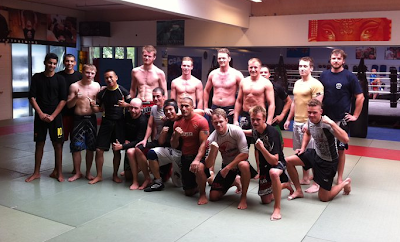 Robson (who normally teaches in Kaisho, Sweden) dropped by my gym today to teach a little bit. He ended up doing three classes; the juvenile team, a no-gi class and a gi class. It is always cool to have him visit and bring some inspiration to the team and everyone seemed to have a great time. My shoulder is still not doing too well, so I had to skip most of the class today. I really wanted to roll with him now he was there though, so I sacrificed some of it's recovery for a few rounds both gi and no-gi. Always cool to spar with him as he has gotten a very special style. So, the the second season of my competition team project has begun. We are training five days a week and I am working very specifically with each participant on gameplans, weight planning, training and so on. We started the physical training program last week and it is going really well, putting a big team effort into getting in shape for the competitions of the coming fall. Lots of people have joined the team this year, 28 in total at the moment. All the guys from last year are on board and there is a ton of potential in the beginners who signed up for the first time. Last year, I ran a six months competition team project in my gym, for those, who wanted to compete in BJJ. Now, that I am back from my trip, I am working hard to begin the second season of the project. Around 40 people have showed interest in joining, so there is a lot of potential for good results and good experiences over the next six months leading up to the 2012 Europeans in Portugal. This week, we had a head start on our physical training routine for the team, running twice a week and named the Beachbody Workout. It has been really though to start it out again after having done basically no strength and conditioning training for my whole trip, but I can't wait to get back in the same killer shape I was in before I left. As you probably have noticed, I have given this blog a little design makeover. I thought it was about time after having used the same design for over 4.5 years. Still some work to do on the subpages, but hope you like it so far! It's been a while since I wrote, that if I got 1000 likes on my FaceBook page, I would post a video of a technique that cannot be defended. I reached the 1000 likes a while back, but the video took a while to get online. It is finally here, and you can enjoy a move, that I still haven't found any defense for. Me and my friend have actually pulled this off in competition a few times. Depends on the mood of the referee, his nationality and your nationality, but sometimes we have gotten away with it. I don't think it states anywhere in the rules that you cannot do this? Training here at home is going well. It is nice to train with all my usual training partners again, and I enjoy sharing some of the experiences I have gained on my trip. Next week, I am starting up my competition team project for the 2012 Europeans, something that I really enjoyed doing last year. 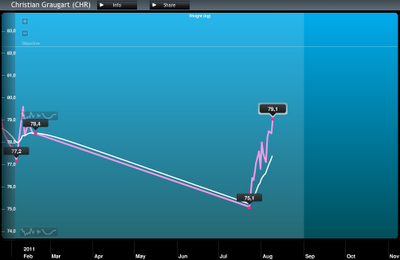 I did lose a lot of weight during the last part of my trip, going all the way down to 74 kilos at one point. I am working hard to put it back on, so I can reach a good weight for competing in the middle weight division. It is going pretty well and I hit 79 kilos this morning already. What a difference it makes to have access to a good rythm of food and training facilities.